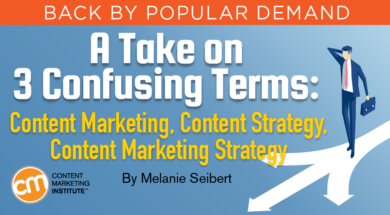 Melanie Seibert works as the senior content strategist at WillowTree. A user experience enthusiast, she has managed marketing copy and technical documentation for companies that include Razorfish, Rackspace, cPanel, and Crutchfield. You can read her blog or follow her on Twitter at @melanie_seibert. Want to learn more about content strategy? Take a look at her content strategy courses, including a free 7-day email course. Editor’s note: You may have missed this article when CMI published it last year. We’re sharing it now because too many people are still confused about the terms. Are you looking for a job – or looking to hire someone – in a field associated with “content marketing” or “content strategy” or “content marketing strategy”? Do these terms pop up regularly in your reading and your conversations? If so, you know that people often misuse them. Not that they mean to. 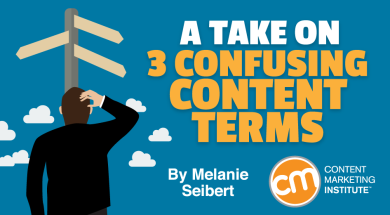 It’s just that the terms often are used loosely, interchangeably even, resulting in confusion that can lead to ill will or poor business decisions. For the sake of our businesses and our careers, all of us who work in these fields need to understand and appreciate the differences and similarities among these terms – and use the terms accurately. For example, search job postings for “content strategist.” Go ahead, don’t be shy. You’ll find dozens of positions. In the descriptions, do you notice a theme? I’m willing to bet that you’re staring at a list of duties around writing, editing, and publishing content. And while that’s a great description of what many content marketers do, it doesn’t fit what content strategists (like me) do. Where’s the disconnect? How does content marketing relate to content strategy, and how does content marketing strategy fit in?